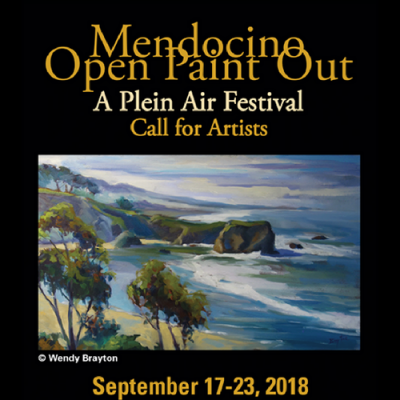 The Mendocino Art Center (MAC) hosts the sixth annual Mendocino Open Paint Out (MOPO), a plein air festival. The Mendocino Coast, located along a beautiful expanse of the Pacific Ocean in northern California, is a spectacular setting for a plein air festival. Artists claim that the quality of light is unlike anywhere else in the world. From the rugged surrounding landscape, to the bay and beaches, to the quaint Victorian architecture and water towers of the town of Mendocino, artists are sure to find abundant creative inspiration. And, you will remember the beauty and tranquility of the Mendocino Coast long after your visit. And, of course, paint en plein air daily!